Well, it’s been around for over 10 years now, so it seems amazing that we haven’t already written a Road Test on the Ford Ranger, but in all honesty, I am glad we haven’t, because this new model Ford Ranger is simply on another planet compared to the truck that found its way over to the UK in 1999 and is now absolute competition for anything in that market place. We have been testing the new Ford Ranger for a couple of weeks and had the opportunity to use it in heavy snowy conditions. We used it as a daily commute, we took to the fields and boggy lanes to see how its 4WD performed and we even loaded it with brick rubble and rubbish for a trip to the dump. The old Ranger was always kind of “Championship” rather than “Premiership” in our minds and whilst not all of its competition was good, some of them were good and it made life difficult for the Ranger, most particularly in the posh double cab sector of the market, however for a builder needing something to do his job, yes old Ranger was just fine. This new Ranger though, has completely changed and it’s now not a case of saying “I could have been a contender ma” because this one really is a contender and for the first time, its planted itself firmly in the premiership, climbed into the top 2 and is arguing over the title with perhaps the Nissan Navara being its only viable competition. Let’s tell you why we say that and what differences there are between old Ranger and this sparkly new model. Well firstly, its way way more powerful, with its new 143ps 2.5 Duratorq TDCi common rail engine being around 30% more powerful than the old 109ps it’s replacing. In terms of torque well it’s even more impressive with around 50% more than the old Ranger, producing a whopping 330Nm at just 1800 revs, compared to 226Nm at 2,000 revs for the old Ranger, so there will be no rice puddings with their skin left on anymore and to highlight that, we timed the ranger 0-60 in just 10 seconds and that’s impressively quick for a big heavy vehicle like this. Despite that, Ford say there is a 25% improvement in economy over the old Ranger and we certainly noticed the difference between this and Rangers that we have used in the past, but it is a big vehicle, so it’s never going to deliver super-mini mpg, but Ford say the Ranger can return a stonking 39.8mpg in the “Extra Urban” cycle. To help a little more, Ford have also doubled the length of the service intervals to 12,000 miles. The load capacity is increased over old ranger and you can also tow a heavier trailer, but the thing you’re going to notice first is the way it looks! Now you might say that as long as something can do its job, the looks are fairly meaningless, but we all know that’s not true. Most of us like our things to look good as well and compared to old Ranger, the new model has its party frock on and would look just at home on the Kings Road in Chelsea as it would in a farmer’s field in Norfolk and that’s a clever trick, which is going to mean the lifestyle buyer is going to be firmly in Ford’s sights now. The Ranger is now just so much more modern and meaningful with its large chrome “look at me” grille and family sized Ford badge and it looks good from every angle. Everything is kind of smoothed out and rounded off and the head lights and fog lights look like they are meant to be there, rather than being dug out of a parts bin just to do a job. Our test vehicle was the Thunder version, so had moody looking polished stainless sports bars between the wheels, a chrome rear bumper with parking sensors built in, chrome door handles, huge chrome door mirrors and very attractive 16” 6 spoke alloy wheels. Add to that the privacy glass in the rear doors and the “Thunder” logo’s on the side and it’s pretty obvious that this new Ranger is much much more than just a builder’s truck. The changes don’t stop at the outside either, as the Rangers interior has been completely revised and it’s really a nice place to be now. Open the door and you’re welcomed by a “Ranger” logo in the sill which lights up in red! How cool is that. Our Thunder had really attractive, comfortable saloon car style two tone leather and heated front seats, although I can not think for the life of me why Ford decided that both heated seats should be switched on with just one switch, meaning that both front seat occupants had to agree for it to be on, or off – what madness is that, particularly as there is a blanking plate in the space that should so obviously be occupied by the second individual switch. All the normal posh car stuff is included, such as electric windows all-round, electric and heated mirrors, air-conditioning, a nice 6-CD/MP3 audio system with a remote music connection socket, and it sounded fine, but we were disappointed that Bluetooth connection for mobile phone was not standard across the range. OK, the technical bit. The Ranger is built on a rugged ladder frame chassis and can carry a full 1-tonne payload and pull an unbraked trailer of 750kg or a braked trailer of 1600kg on the 4×2 versions and a massive 3000kg on the 4×4 versions, so it’s a proper workhorse. For off road, Ford say the Ranger 4×4 has a 205mm ride height and can tackle a 34% approach angle at the front and a 20% departure angle at the rear, without grounding (translate that for me will you) and should you find yourself in deep water in the 4×4 versions, its going to take a depth of over 750mm, before you get your feet wet. But basically, this new Ranger, is pretty good off road and whilst some businesses use their vehicles off-road a lot, its clear by simply looking at the Ford Ranger brochure, where you will find a muscular guy pulling a rope, climbing mountains or riding bikes and an attractive girl with a surf board, who Ford believe are, or perhaps want their customers to be. 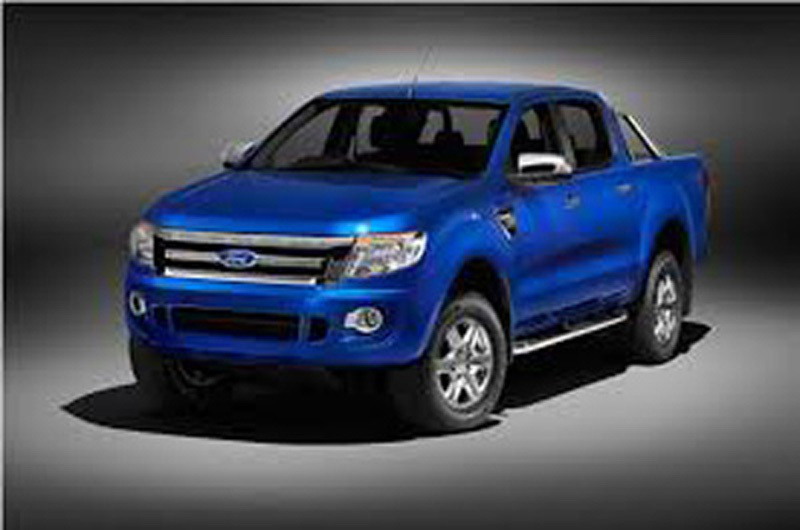 Ranger is available in 3 body styles, the Regular Cab, the Super Cab and of course, the Double Cab. The length of the load area varies from 1530mm to 2280mm depending on the version you choose and on XLT upwards, you get a really well made and nice looking bedliner that covers the entire load area, including the tailgate. All models have load area tie downs and all models can accommodate a Euro pallet and the tailgate can be lowered to 180 degrees to let you get close with a fork truck. Prices range from £13,900 for the 4×2 regular cab, with a basic super cab costing just £300 more, whilst the popular double cabs which are all 4×4’s start at £17,250 with the XLT at £18,675, our Thunder sat at £20,100, with the top of the range Wildtrack 3.0 version costing £22,350. The Ranger is infinitely customisable and comes in a choice of 9 colours, all but 2 are metallic. You can cover the load with a hard, or soft tonneau cover, or maybe choose a hardtop and these come in more flavours than a bag of Opal Fruits. A moody “Fall Guy” styled sports bar is available from the accessory catalogue and even different Alloy Wheels if you are not happy with the factory fit items and that’s before you start exploring the non-Ford accessories that are available. We try to be as fair as possible and as honest as possible when we test vehicles and on many occasions, they turn out to be just how we expected, but occasionally, we get a surprise and that’s what happened with the Ranger. We didn’t expect it to be as good as it is and because of that, we strongly suggest that if you are looking at this type of vehicle, that you go to your local Ford dealer and take a look and in fact, if you’ve driven or owned an old Ranger, its even more important that you do this, because you simply wont believe the difference.